Many years ago, back when we lived in Oregon, we needed a chest freezer. Montgomery Wards was going out of business at the time, so we went and bought the biggest chest freezer they had (it was enormous). Our Oregon house was old (1874) and small (850 square feet), and we had had absolutely no room for such a monstrous appliance. There was no question where it would go: the basement, which was little more than a dirt-floored half-space between the floor of the house above and the sloped hill beneath. The basement was damp and dark, with no lights and only accessible by an outside door. Except for the darkness, it was a great place for a freezer, and we used it a lot. It allowed us to do things like freeze surplus meals and take advantage of inexpensive or past-its-prime produce. One day Don expressed interest in some homemade onion soup I had previously frozen in individual-sized portions. "I know just where it is," I said confidently. Taking a flashlight, I went into the basement, fetched the onion soup in its baggie, and brought it into the kitchen where I put it on the stove to heat. As the soup heated, I noticed a lovely, fragrant smell permeating the kitchen. It smelled delicious, but most decidedly NOT like onion soup. Further investigation revealed I was simmering puréed bananas from a too-good-to-pass-up sale the week before, which I had frozen for future batches of banana bread. We chuckled over the "banana soup" incident for a long time. I let the cheese defrost for a couple hours. 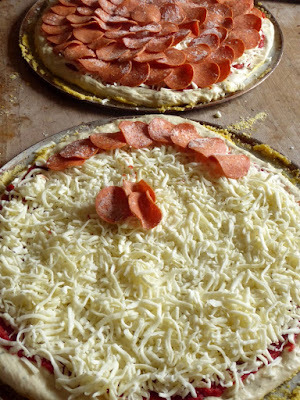 Meanwhile I made the pizza dough, let it rise, and formed the pizzas. 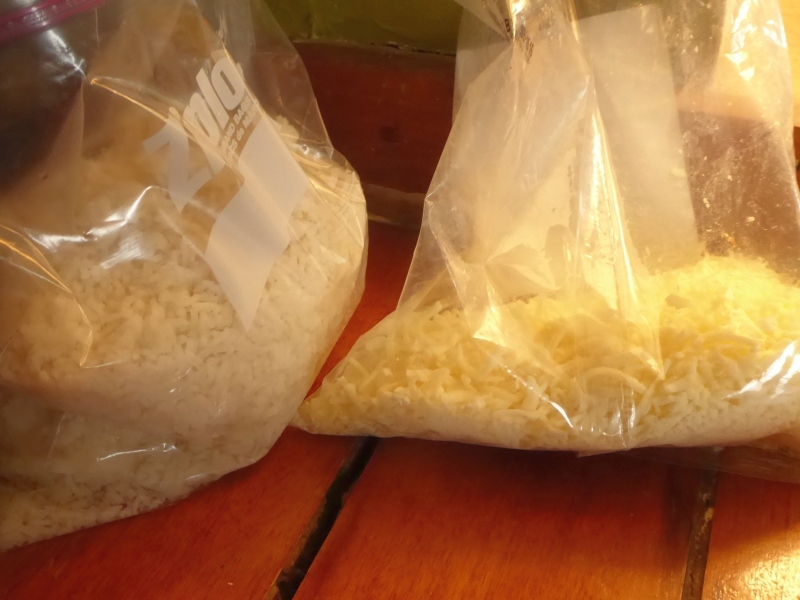 But when I reached into the bag of cheese to spread it over the sauce, I pulled out -- rice. 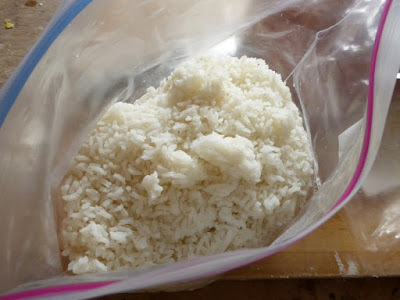 Leftover rice I'd frozen a couple weeks ago. Labels. Yes, labels are good. I keep masking tape and a sharpie in the kitchen drawer to label all my containers with. Yes! Labels are a real time and money saver. I have a bad habit of forgetting to label herbs that I've dehydrated and put in jars. Sometimes you can tell what they are by smelling them, but not always. Oops! And the older we get, the more we need them! Famous last words "I'll remember that!" And that's how we made naan bread out of old pasta dough a few weeks back. Woops! LOL, I can relate to this. I usually label, but there have been a few times that I got into a hurry and just packed things away without the labels only to discover on thawing , that what I thought I was pulling out was something different . Love your stories. That reminds me of about 15 years back when I was visiting my sister. I liked to cook and it was expected by by nieces. I had put some flour, cornstarch, etc., in ziplock bags rather than have to find the ingredients in her pantry or purchase them. I was making chocolate chip cookies when I noticed the cookies spread thin as a paper. I went over what I'd done only to finally discover I had used the cornstarch rather than flour. They weren't bad. Just thin sugar wafers.